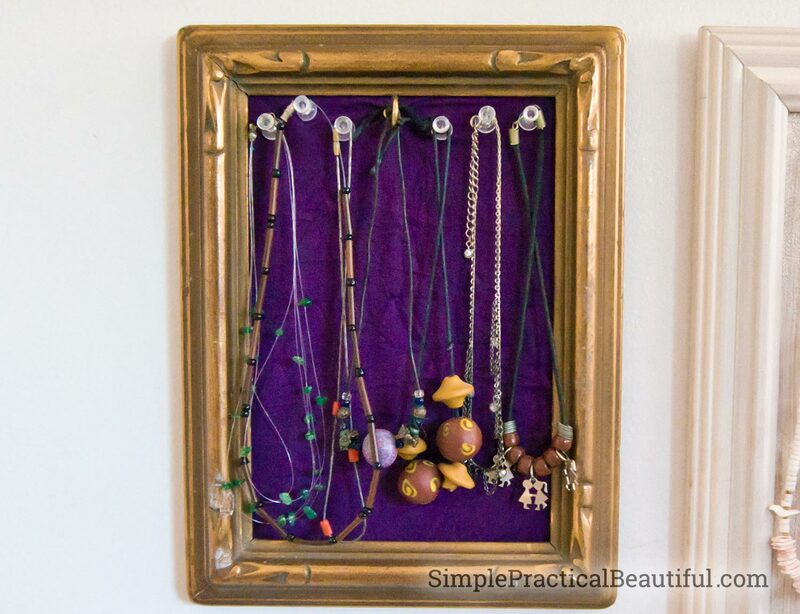 Today I want to share one of my favorite projects with you: old picture frames repurposed to make a jewelry display in a gallery wall. 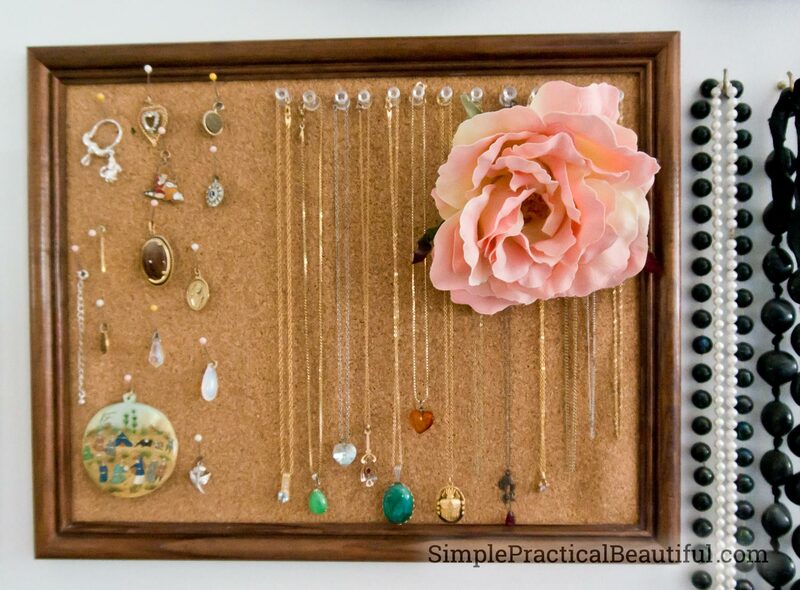 It’s a storage solution, room decor, and a very convenient way to add accessories to an outfit. In general, I tend to dress very simply. But it struck a chord that adding an accessory would finish an outfit, just like the accessories of a room complete it and make it feel like a lived in space. So, I tried. And failed. 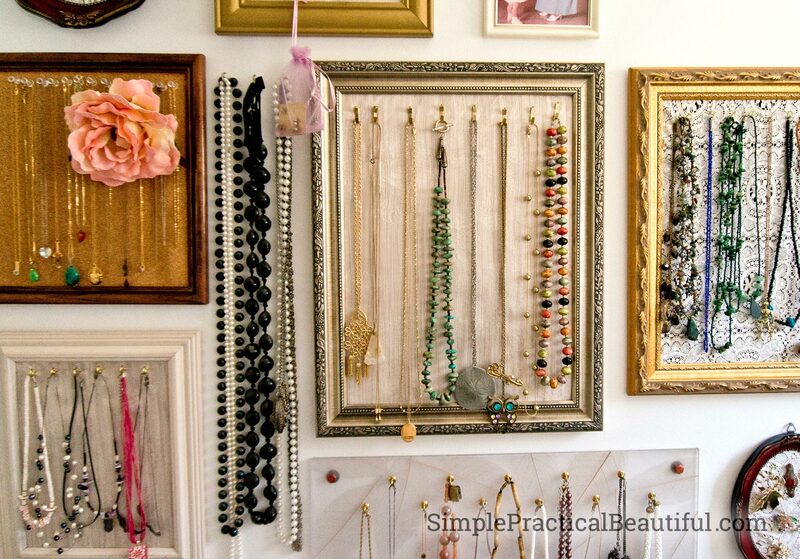 I realized that because all of my jewelry was neatly tucked in lovely jewelry boxes, I never wore any. In the rush to get ready each day, the last thing on my mind was rummaging through tiny drawers to find something that went with my outfit. I needed to be able to see and get to my entire stock of jewelry all at once. I needed a gallery wall. And I happened to have space in my tiny powder room (a.k.a. 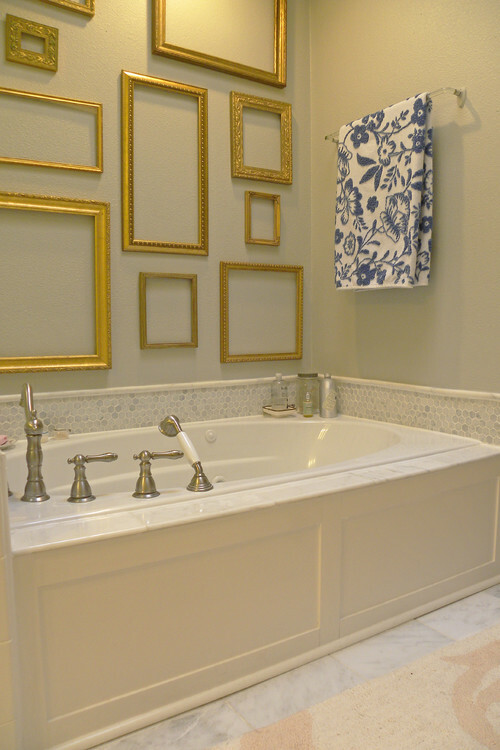 master bathroom) to make one. I really like making gallery walls with all different shapes and sizes of frames. I did a gallery of my children’s artwork where I put foam core covered in geometric wrapping paper into frames and added push pins. My kids pinned up their favorite artwork, and changed it out whenever they had something new to show. 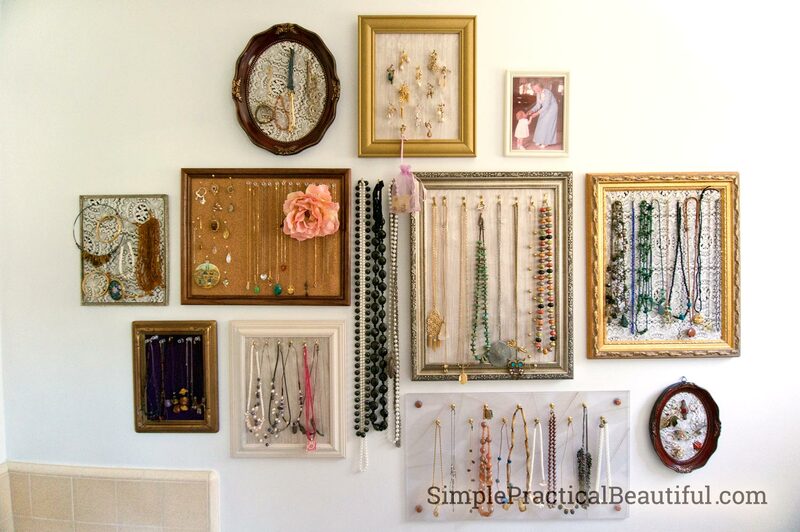 This gallery of jewelry frames would need to be a little different since they would need to hold the weight of the jewelry. I also wanted them to look a little softer, more like jewelry boxes, so I used fabric scraps on the backing. 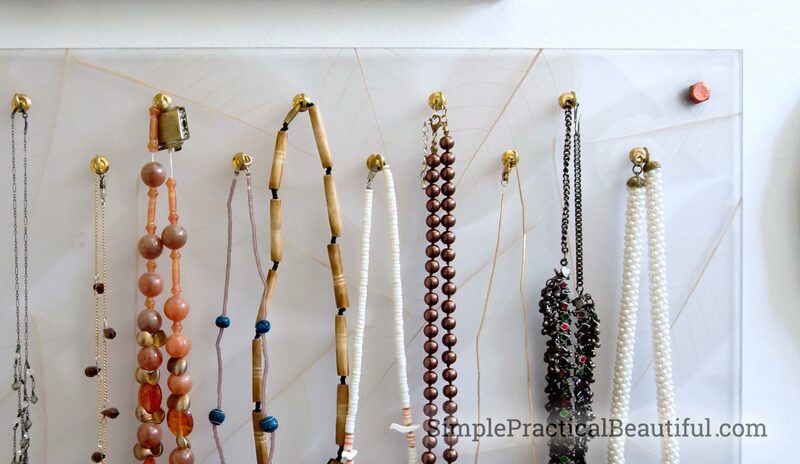 I wasn’t sure what would work best as jewelry hangers (hooks, wire, etc), so I tried several. I ended up liking the eclectic look of having each frame different, so I kept it that way. 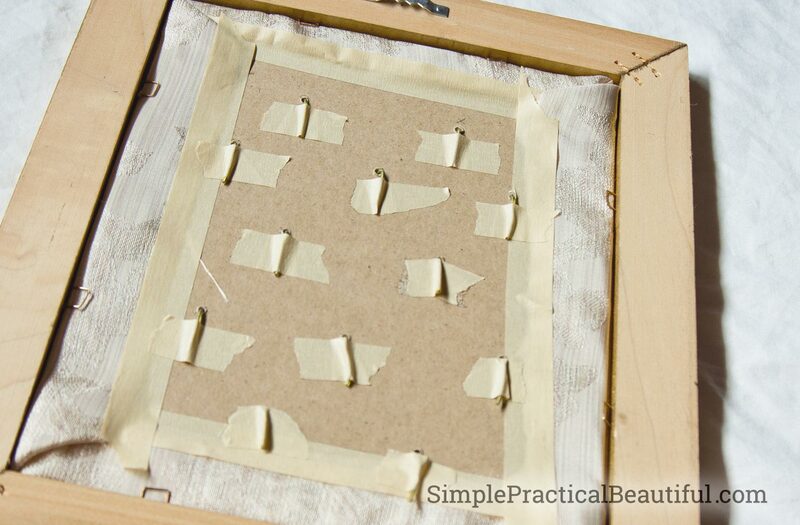 I used a 9X11 frame, and stuck cork drawer liner onto the back cardboard and added push-pins. Perfects for my chains. I also used sewing pins to display other charms I had, so I can swap out the charms easily. I also stuck in a huge flower pin. I rarely wear it, but it looks really eye-catching on the frame. This frame had a corrugated cardboard backing (thick, but not solid), so I used pushpins again. I covered the cardboard in a purple fabric that matched our bed’s duvet cover. 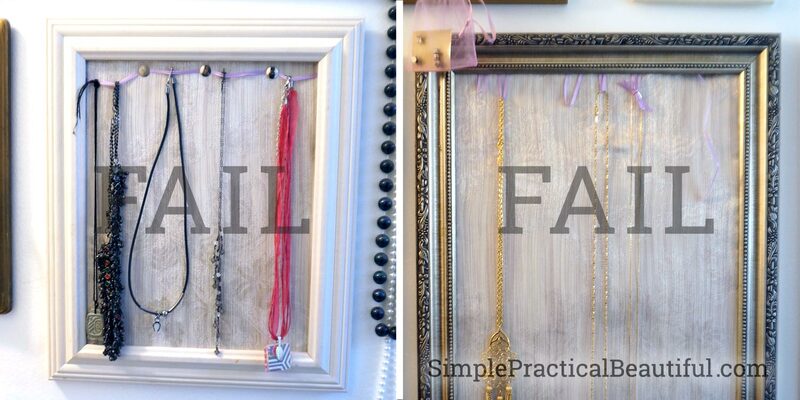 I had to hang smaller, lighter necklaces on this frame because the push pins don’t hold very much before falling out. 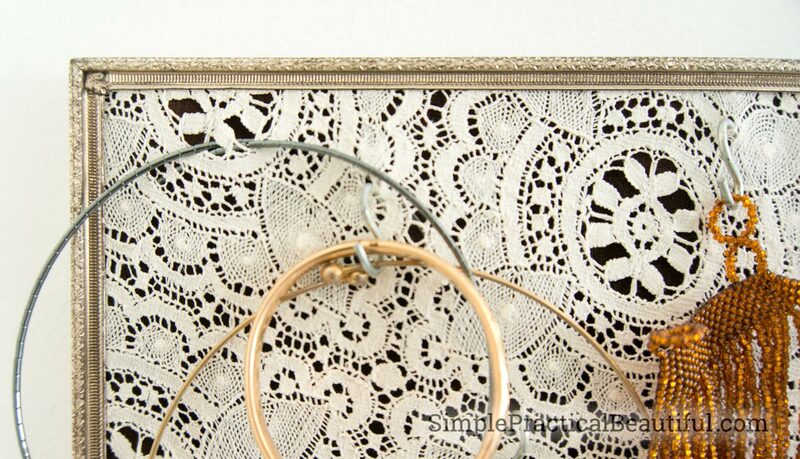 I used an old lace doily that was stained and ripped for these frames. Luckily, all three frames had a dark colored backing that looked good under the lace. The rectangular frame is even velvet flocked behind the lace, which is pretty cool. 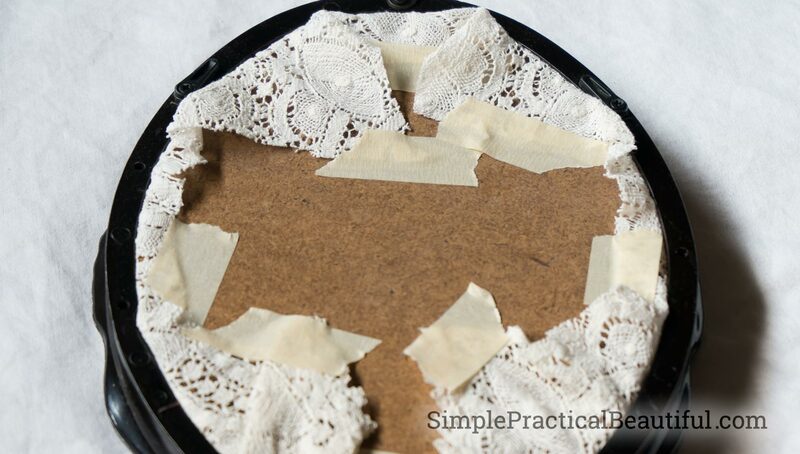 I wrapped the lace around the backing and taped it on with masking tape. I put S-hooks and wire coils on the lace for hanging rings and bracelets. Some of the pins and necklaces I just hung straight on the lace. This is the back of one of the frames with lace, so you can see how simply I attached the lace. This is a bigger frame with the same lace and wire coils. The cardboard backing didn’t look nice, so there is some purple fabric underneath the lace. 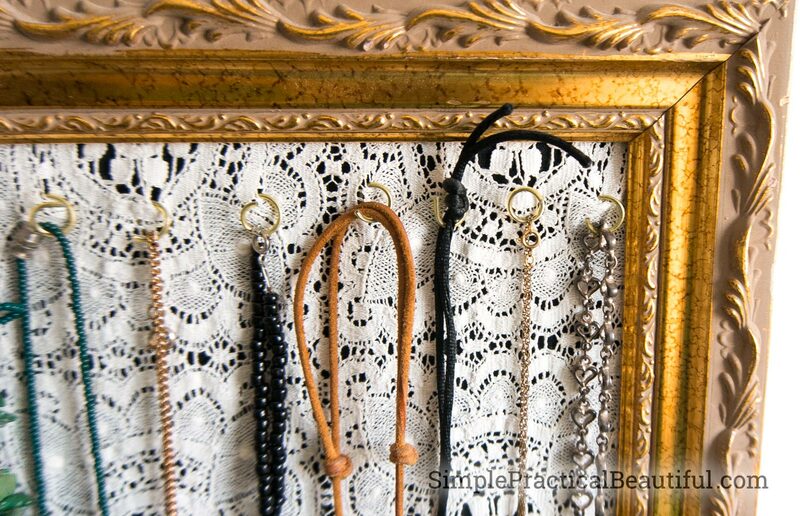 I used the same lace on this frame, but because I need this one to hold larger, heavier necklaces, I didn’t want the lace to bear the weight. It would have ripped. I poked holes in the backing with a hammer and a small nail, then pushed some wire pieces through each hole. The wire behind the frame pushes against the backing and holds the weight of the necklace. I also taped the part of the wire behind the frame to the backing for extra security. Since I made wire coils for a few frames, here’s quick explanation. 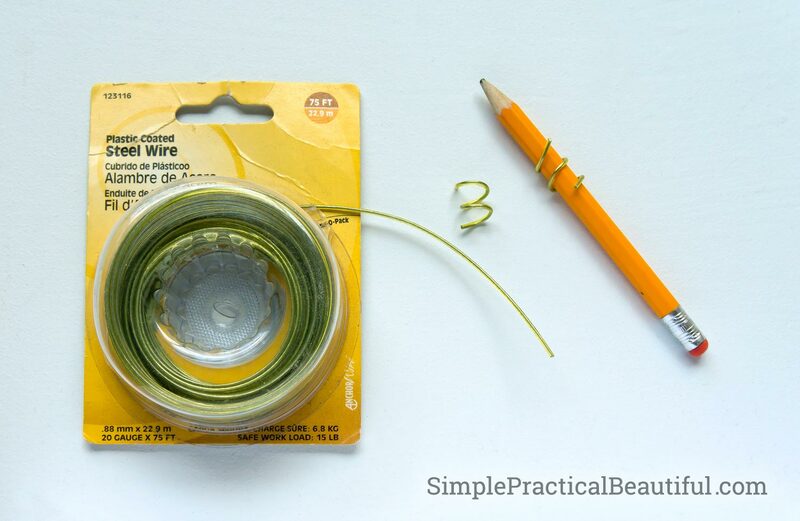 I cut a 2 inch piece of plastic coated wire and wrapped it around a pencil. I twisted it halfway into the lace and hung jewelry on the half still sticking out. 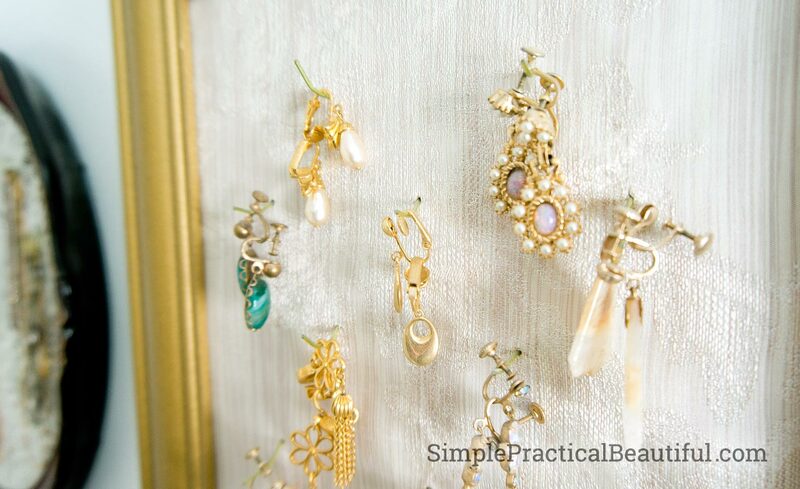 There are so many cute ideas out there for displaying earrings. Unfortunately, they are all for pierced earrings. I don’t have pierced ears so all of my earrings are clip-on or magnet earrings, which don’t work with all those cute ideas. After taping the fabric on the backing, I used a hammer and nail to make 12 holes. Then I pushed a small piece of wire halfway through each hole and taped it onto the back. I bent front part of the wire a little to make it more hook-like. I also have a little bag of magnet earrings hanging on a wire. It works best to keep them contained because the magnets stick to everything. My favorite display turned out not to be a frame at all. I had a scrap of resin from 3Form that I screwed hooks into and then bolted onto the wall. I put washers behind the bolts to make the plastic hang off the wall a little. I painted the bolts copper, which I like, and one day I will get around to painting the washers too, maybe. 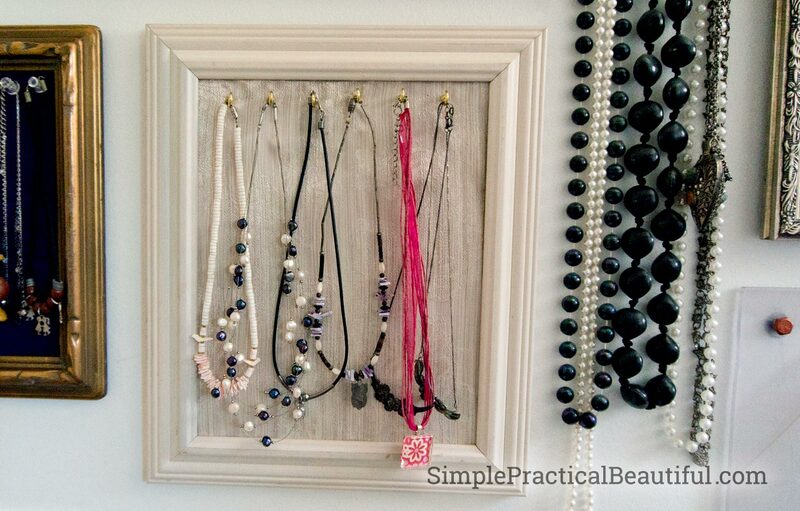 I have a few longer necklaces that didn’t fit inside any frame I own or had room for, so I screwed some hooks straight into the wall. 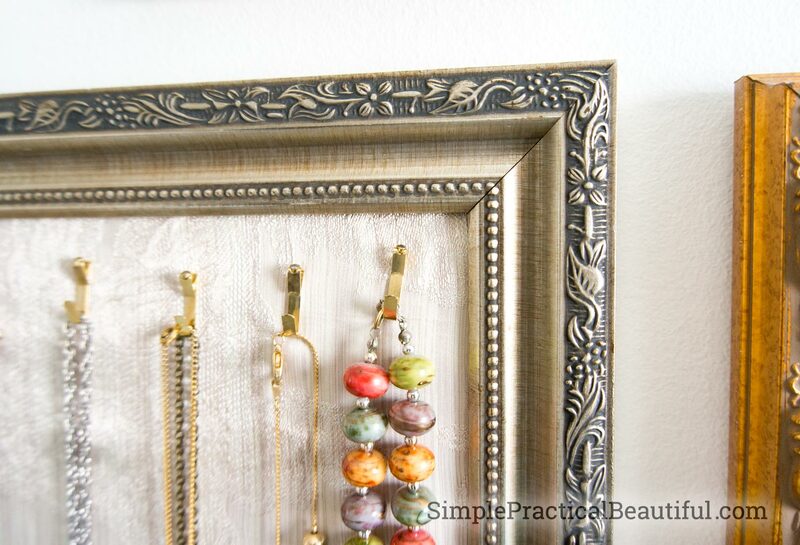 It was so easy and works so well, that if I had to do this whole thing over again, I might just use hooks in the wall for everything and hang backless frames around it. I had 2 fails. The first was pinning ribbon across the top of the frame. It was too much work to get the necklaces on and off because I had to undo and redo the clasp each time. Plus, I didn’t like how it looked. The second used the same ribbon, but I taped loops over the top. The loops didn’t hold the weight, and it had the same problem of too much work re-clasping the necklace on every time I tried one on. When I redid this frame, I added hooks. 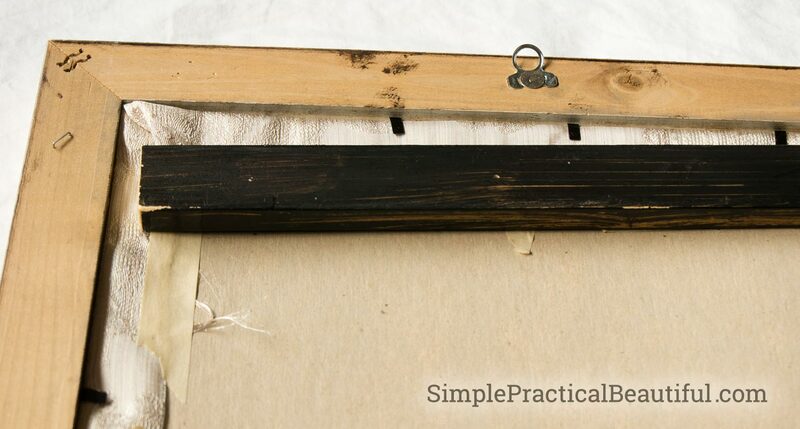 To hold the hooks on this frame, I attached a thin piece of wood to the top of the back. The hooks screw through the cardboard backing and into the wood. It’s really sturdy. To fix this frame, I found some lovely gold picture hanging nail and hooks. I’m not sure why you would hang a picture with a gold hook that would end up hidden behind the frame, but for my project, these are great. There is a thin board behind the backing (like the last frame) to hammer the nails into. Although I should have marked where each nail went before I hammered. The hooks ended up a little unevenly spaced. 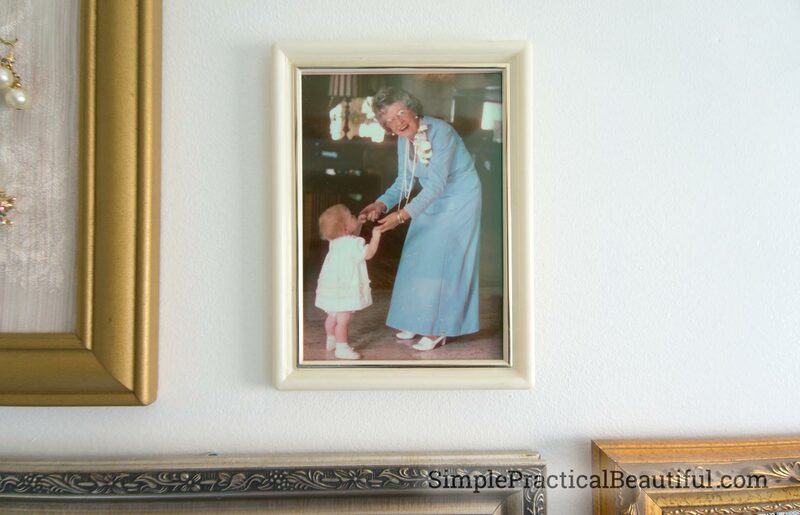 Most of my coolest jewelry came from my grandmothers, so I hung a picture of my Great-Grandma Fox dancing with me as a little kid to go with my jewelry collection. It makes me smile every time I look at it. 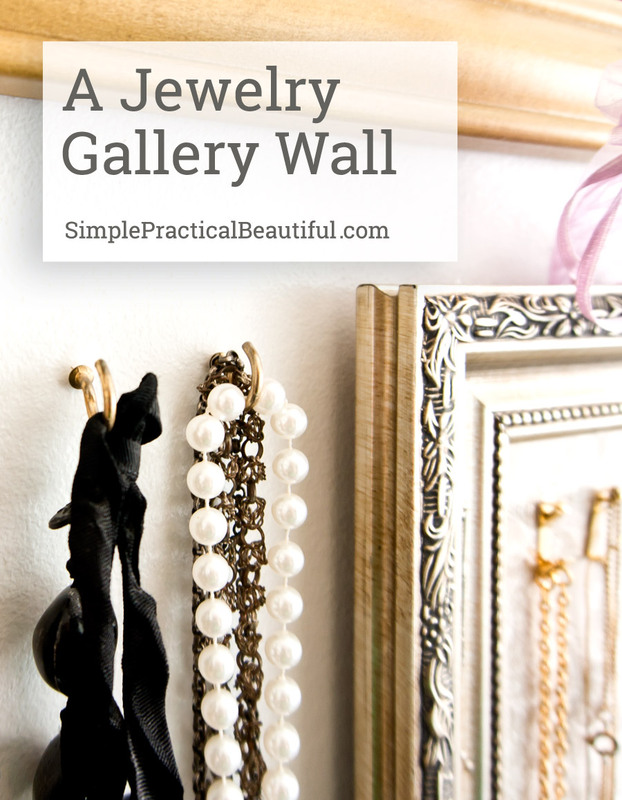 That’s my jewelry display gallery wall. You’ll notice that none of the jewelry is very valuable. That’s all stored somewhere safer. Also, one day I would like to paint the wall behind the frame gallery a deep color, I’m just not sure what color. Until I decide, I can still enjoy my jewelry as a decoration. And I actually wear my jewelry now! Like this idea? 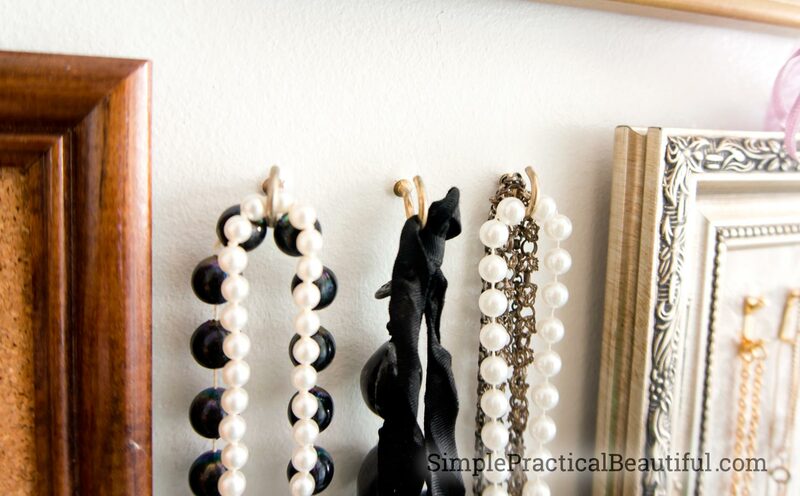 Click here to subscribe to Simple Practical Beautiful for more! This post was shared at some of my favorite link parties. This is stunning! Pinning and sharing. I had never seen it before on this scale. This is so beautiful. The lace is so delicate and takes the whole thing to another level. And thansk for warning us about the fails. I have had a few of those myself. Thanks. 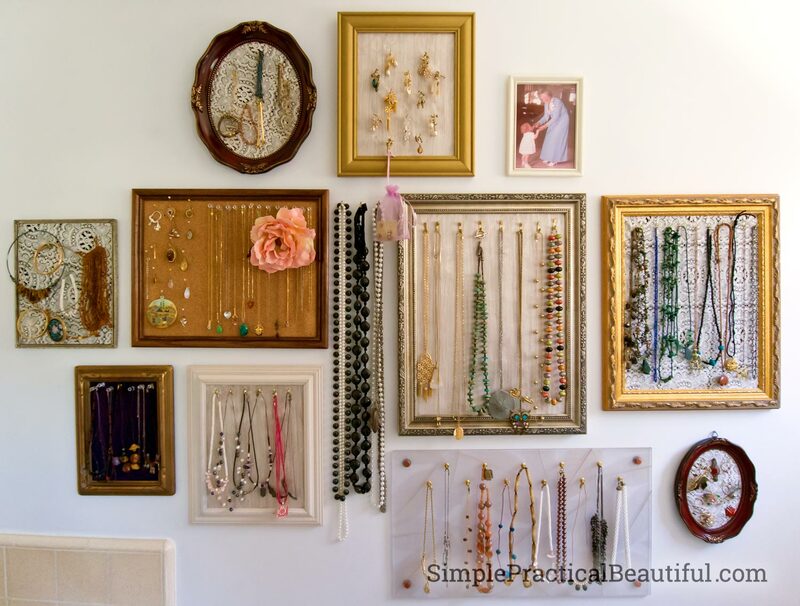 I had just one frame of jewelry before, but I like to see all of my options. 🙂 Plus, I had a big, useless wall that needed something interesting. I love this idea!! 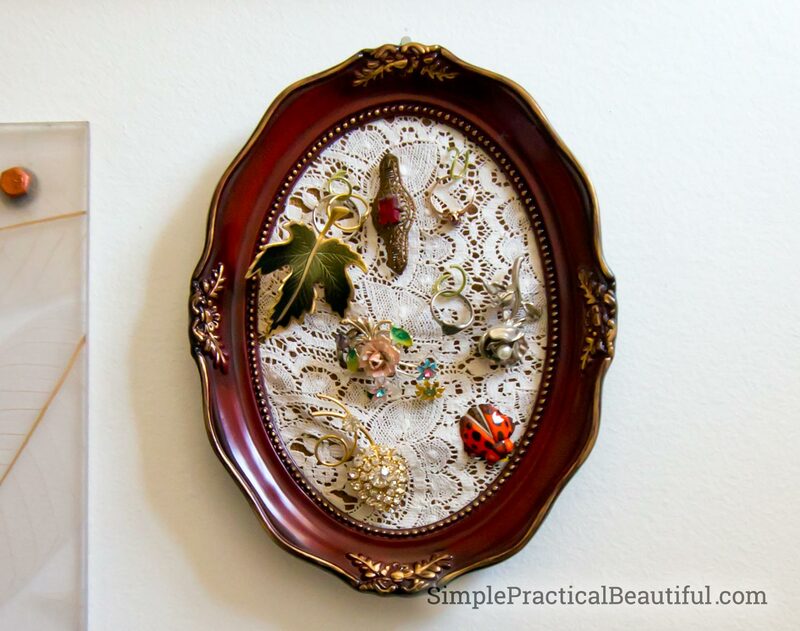 It’s a beautiful and creative way to fill frames! !